Crewe striker Max Clayton has been named the Football League young player of the month for August - and recent events mean it is an accolade with genuine resonance for any aspiring youngster at Gresty Road. The last Alex player to win the award was Nick Powell, who received the trophy in January as a 17-year-old. Powell went on to become the first Crewe player to scoop every award at the club's end-of-season honours bash and scored a spectacular farewell goal at Wembley in the League Two play-off final. He then made a multi-million pound summer move to Manchester United, for whom he scored on his debut in last weekend's Premier League victory over Wigan. "It still gives me goosebumps when I see him come on for Man Utd," Clayton, 18, told BBC Sport. "Nick and I played together from the age of five or six and there was not much between us. He has pushed on and I am delighted for him. Hopefully I can go on and do bigger things." Powell is still talked about affectionately at Crewe and, with his new club rarely playing on Saturdays, has been a regular at Alex home games this season - although apparently the car he arrives in is rather grander than the one he drove before moving to Old Trafford. If anything, there seems to be even more fondness for Clayton - and even greater expectations. 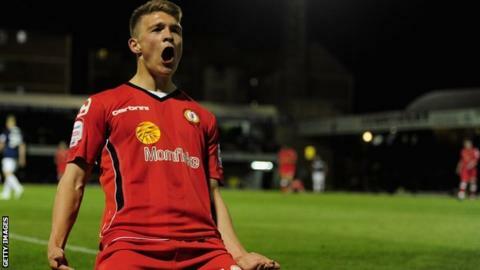 Crewe boss Steve Davis, who also played for the Cheshire club and whose son Harry is a current Alex player, constantly talks to Clayton about his game, pointing out the little details that will help him improve, and is convinced his young striker is heading for the top. "I have got big expectations of Max and I think he will follow in Nick's footsteps at some point, but he is not ready yet," said Davis. While Powell is an attacking midfielder who has already amassed a showreel of spectacular goals, Clayton is an out-and-out forward who has been compared to Michael Owen. Clayton readily acknowledges that Owen was his hero growing up and bashfully admits that he finds it "unbelievable" when he hears comparisons with the former Liverpool, Real Madrid and Manchester United striker. He was used sparingly last season in the uncompromising environs of League Two, but while that was the more physically imposing Powell's breakthrough season, the third tier seems to be shaping up to be the small but speedy Clayton's stage. The youngster scored twice in the Capital One Cup win over Hartlepool in early August and notched the winner against Coventry in a League One match shortly after, but his overriding priority at the moment is to score more often. "Going through the youth system I scored a lot of goals," said the effervescent and likeable Clayton, whose father is a former Alex striker and brother Harry also a member of the current first-team squad. "Throughout the youth levels I always played well and scored. Right now I seem to have got the playing well thing going, but I need to be more ruthless in front of goal." He was one of seven players in the starting XI at Carlisle on Tuesday to come through the system at Crewe and Davis reckons the signs are there that Clayton will be able to satisfy his thirst for goals. "His movement and his ability to score with both feet are his key attributes," said Davis. "But his link-up play, touch and awareness is also excellent. He is great to work with, wants to get better and is very grounded. "I think he is ahead of Nick at this stage of the season when compared to last year and we are now playing in a higher league." Clayton's potential is hardly a huge secret. He has played for England at Under-16, U17, U18 and U19 level. He played and scored for England at the Under-17 World Cup in Mexico last year and Premier League scouts have been in regular attendance at Crewe fixtures this season. "I always laugh when I see the scouting list each week," added Davis. "When the managers start turning up, I know that something is getting closer." Davis is nothing if not realistic when discussing the prospects of Clayton and his other young players. In addition to the departure of Powell in the summer, 22-year-old midfielder Ashley Westwood left for Aston Villa. "Their mates are still at Crewe and they can see the progression that people like Nick have made - it can only help to spur them on," said Davis. "I am sure that when the time comes there will be plenty of clubs knocking on the door and away Max will go." Previous departures have helped to fund Crewe's excellent training facility at Reaseheath. In the hydro-pool room, director of football Dario Gradi recently had a local artist paint a mural of the club's players who have gone on to greater prominence. There is a notable chunk of white wall next to Nick Powell, but it might not be blank for long.